Warning! This game is addiction enabled! Be prepared to have fun and enjoyment in this new awesome game! Are you stressed and tired for the day? Here's a new game that will relieve your stress away! 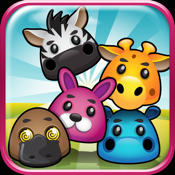 Animal Bubble Dots Zoo Splash is an easy game to play. Just make a long dot connection of the same animal and earn your points! Complete the game in many levels. You can even play with friends via Multiplayer mode. Also, you can compare your points with your friends with Game Center! Ain't that fun? Don't miss out the fun! Download the game now!